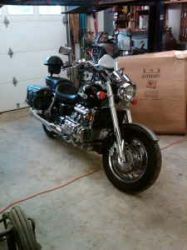 The 2001 Honda Valkyrie for sale has a flat 1520cc 6 cylinder engine and less than 20k miles; in like new condition. It has a trunk, saddlebags, stereo, intercom system, full body fairing, dual headlamps, crash bars and highway pegs. The 2001 Valkyrie has a very attractive green and silver paint color scheme and will out-perform any Harley out there! The Valkyrie Interstate was only manufacture from 1999 through 2001 and it's getting more and more difficult to find a nice one like this with low mileage. If you know a thing or two about this bike feel free use the comments form below this ad to write a review or voice any opinions that you may have formed from your own experiences with a motorcycle similar to the 01 model Honda for sale listing any problems with its performance, places where we might go to find used Honda motorcycle parts for a 2001 model or anything of interest that you feel potential buyers should know.. Thanks for visiting GoGoCycles Used Motorcycles for Sale and for your interest in the 2001 Honda Valkyrie. The location of the bike for sale is Meridian and in my opinion my asking price for it is cheap enough that it will be difficult to beat on Craigslist or on Ebay; $9250! If you want to take a look or have questions, text me for more details or to request picture and don't forget to mention that you found this ad on GoGoCycles Used Motorcycles and Parts for Sale www.gogocycles.com.